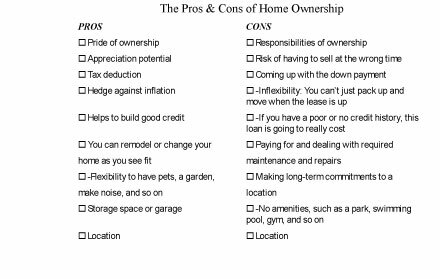 If you’re considering buying a house, use the Pros and Cons of Homeownership worksheet provided here to guide your decision as to whether home ownership is right for you. Put a check mark in one box on each line based on which situation you feel more strongly about and whether that situation is a pro or a con. Click here to download and print the Pros and Cons of Homeownership worksheet. In this worksheet, you identify the major advantages and disadvantages of owning a home. This decision involves considering all reasonable options before you come to a final conclusion. Can you lease an apartment or home and better fulfill your personal needs and objectives? Are there any other options to consider? Another important consideration is how long you plan to stay in the home. As a general rule, to cover just the costs of buying and selling the home (which includes obtaining a mortgage and an appraisal, application fees, inspections, movers, title insurance, legal fees, and real estate commissions), a property has to appreciate at least 15 to 20 percent for you to break even. In addition to knowing how long you plan on staying in the home, you also need to be able to guesstimate how your new home will appreciate over that time. In most real estate markets, this rate of appreciation typically takes three to seven years. Buying a home makes little or no sense if you don’t plan to stay there at least three years. Nolo, the nation’s oldest and most respected provider of legal information for consumers, has a series of great calculators you can access at no charge through their Web site. One is entitled, “Should I rent or buy?” You plug in all the facts and assumptions, such as inflation rate on rental prices, your tax rate, average maintenance costs when owning your own home, appreciation expectations, and how long you plan to stay, and the calculator does the math for you. If you determine that purchasing a home has more advantages than disadvantages, and you’re confident of your willingness and ability to stay in the home for a number of years, you can begin to explore how much home you can afford.